Yep, a friend of mine showed me this the other day, too. 3 then 4 then 5 years, all on the same day. So I’m guessing 8/29/23 is going to be the next big one, then. Hey, after 8/29/23, the next one would be 8/29/30 which coincides with the new UN Agenda 2030 deadline if I’m not mistaken. What a coincidence! Imagine that. 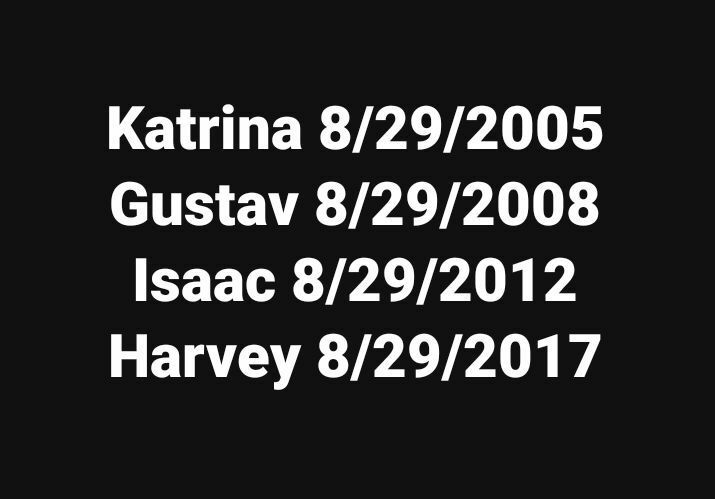 Then you have Hurricanes Rita and Ike around the same time as well, 4 years apart–and hitting generally the same areas (Rita hit Cajun country, Ike hit Galveston). The time was late in September.